The Grinch hated Christmas and wanted to ruin it for all the kids. As he was stuffing a Christmas tree up a chimney to steal the tree, Cindy Lou came down the stairs to get a glass of water. He looked at the Grinch and thought it was Santa, and asked what he was doing. The Grinch replied that he need to get the tree to his workshop to fix a light. From there, the Grinch and Cindy developed a relationship and Cindy Lou always tried to look out and be kind to the Grinch. The Grinch showed that he cared by saving her a couple times when he wanted to destroy all the presents in Whoville and she happened to be on the sled of presents. He saved her. 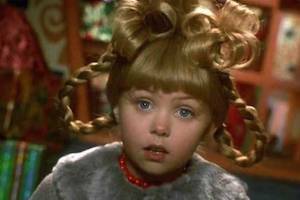 Cindy Lou Who is the little girl in Dr. Seuss’s book The Grinch that wins over the Grinch’s heart. Click here for more Christmas costumes to dress up as the Grinch, Santa, Mrs. Claus, a Snowman, a christmas tree, elves, reindeers and so much more. Find Cindy Lou costume ideas below including her unique wig! You can pair this costume with the Grinch, or the Grinch Santa. 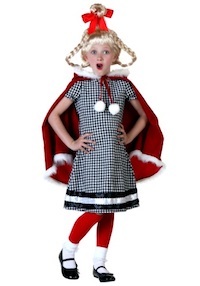 The gingham pattern dress looks festively adorable with any color of tights and shoes you add, especially red and white, to match the soft, warm look of the hooded cape. Check out the matching wig we’ve created to go with this dress, and your Christmas girl will warm even the grumpiest grouch’s heart! these buck teeth can be used for pretty much any occasion. And when you do use them, you won’t be the only one with a big beautiful smile on your face. Everyone else will be cracking up too! Click here to get Christmas Girl Cindy Lou Buck Teeth. 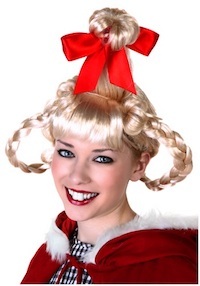 This Christmas Girl Wig is just the solution for the lady who planned such a magnificent Christmas extravaganza. You worry about embracing the season, and we will worry about how to keep you up on the latest festive styles. The tall tree like hair bun on top tied with a red satin bow is all the rage for the holiday season. he black and white gingham patterned dress is a sweet, simple look that will compliment many festive accessories you may want to add, like socks and a cute pair of Mary Jane style shoes. The velvet and faux fur lined cape and hood adds some joyful color to the outfit, and looks like it could keep you toasty during a snowy night of cheerful caroling. Put your own unique spin on this costume for your celebrations, or check out our accompanying wig to complete the Christmas Girl ensemble. 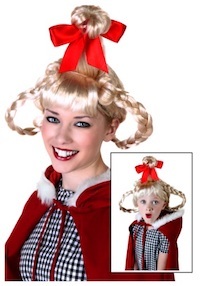 Click here to get Cindy Lou Chistmas Girl costume for Adults.